Templates: Re-usable and shareable custom assignments built from practice and assessment questions. Sometimes, Albert's guide levels have a large number of questions. 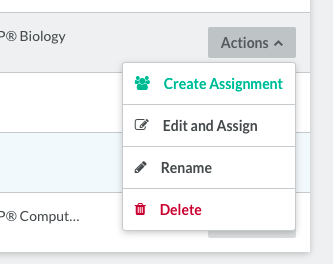 If you did not want to assign all of them at once, a template allows you to create smaller, custom assignments. Practice Exams: Timed, summative assessments that are maintained by Albert and can not be edited. Note: Only teachers at licensed schools can use templates. If you are not an approved teacher at a licensed school, please explore our pricing page. Method 1 - Add an ENTIRE topic of questions to a template or create a new template. Click the three dots to the right of any topic or subtopic that you'd like to assign, and select the 'Add all to template' option as seen in the image above. Clicking on 'Add all to template' will open the Template slide-out. Create a new template and click on 'Add (n) questions to template,' or select and add questions to one of your previously used templates. In both cases, all of the questions in the topic will be added to that template. Method 2 - Create/add SPECIFIC questions to a template, directly from a question list. You will see check boxes next to all the questions in the question list. Once you select at least one question, the green button at the bottom for 'Add to template(s)' will be enabled. Once you have templates created, you can use them from within the 'Assignments' tab of any class you own. Your templates are not class-specific and can all be accessed from any class. 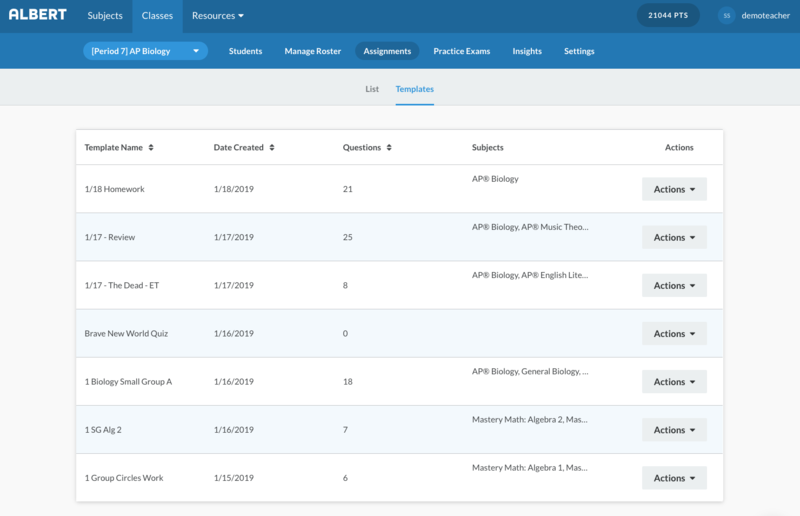 Create Assignment: Creates an assignment from that template's question list and takes you to the Assignment Creation Form, where you'll choose recipients and assignment settings. Edit and Assign: Allows you to remove questions from the template and re-arrange the order of questions. You can't add more questions from here; that should be done from a subject's guide page or from any question list that is not a template. From here, you can save changes to the template and/or assign the new edited version. Rename: Give the template a new name for better organization. Delete: Deletes the template, but not any assignments created from that template. Teachers can share assignment templates with other teachers simply by sending them a link. On your templates page, click the 'Actions' button, and then the 'Edit and Assign' button that appears in the drop-down menu.